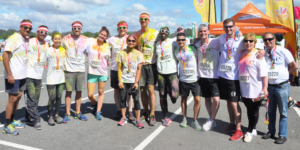 W!se participated in the New York City Color Run 5K event at Citi Field. The team walked or ran through the stadium while being splashed with different colors! It was lots of fun! Each participant was responsible for a $300 pledge and the registration fee. Participants received a W!se Team shirt and a goody bag.